Today was my final day at work. I thought I was going to be fine, and I was for an hour or so. I guess it just suddenly hit me. About the same time, one of my favorite students/residents stopped by to give me my daily hug. She saw a few tears and that was all it took for her to break down. I decided at that moment that it was time to go. So, here I am, and I decided to utilitze some of my day to tackle a couple of challenges! 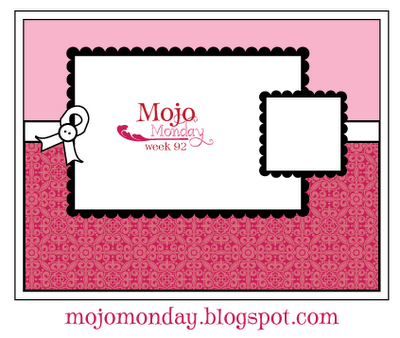 Today's card is for Mojo Monday's challenge, which is the sketch you see below, and also for The Greeting Farm's challenge, which is Polka Dots. The little girl stamp is from The Greeting Farm. Isn't she adorable? This is the first of their stamps I have ever owned, and I must say that I am hooked. What beautiful detail, and images they have! The sentiment is Hero Arts, and the DP is from Gina K's freebie section on Stamp TV. I used my Kooh-I-Noor pencils, and low odor mineral spirits to color. CS is DCWV. Have a good evening, and I will see you all tomorrow! I just finished the card above for a summer swap. I'm pretty limited on summer themed stamps, and since this is a TAC swap that I was invited to play in, I chose these stamps! The 'waves' are just a little DP from TAC's Gentle Blessings set, I stippled a bit of blue for sky, and the rest is just stamped and colored! The innertube is colored with hot pink Gelly Roll glitter pen, and the dots on the tube and on the wave are done with a blue glitter pen. CAS for sure! Hope you like it! I have some news! 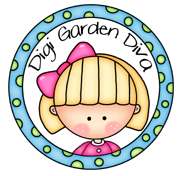 I had posted a while back on my sidebar about Anna's big give-a-way. Well...she posted the winner a while ago, and it was me!!! So just think - I won't HAVE to clean and scrub and dust when I start being retired, because I have new toys to play with!!! 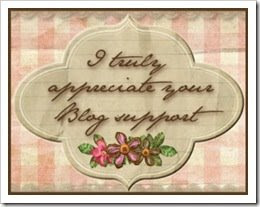 Anna's blog is wonderful, so be sure to drop by and visit her now and then! Hope your Sunday is relaxing and quiet - it's only supposed to get to 86 or so today, the humidity is supposed to drop a bit, and there is a breeze!!! I'm off to water our garden! I was just getting ready to leave work yesterday, when I hear my name over the loudspeaker, calling me to the front office. (I thought that rather strange for a moment, and then I could hear "C", one of our students in a rather loud form, so I thought maybe she was wanting to talk for a few minutes) Anyway, by the time I got to the office, there were many, many people gathered. The employees of the Children's Home (where our school operates out of) had gotten together, ordered a cake, and were having a Retirement send off for me. It was very nice to feel the love of these people - they have been my 'family' for over 13 years, and I love them all. Mandy (Amanda), one of them, actually signed up yesterday to follow my blog! Mandy, if you are reading, thank you for everything, and I am so happy that you are following me - hopefully, we can stay in touch! Sigh..., another of those bittersweet moments! Good friends, good cake, happy day, sad day...you get it, right? I was finally able to read my card at about 10:30 last night, and yes, I did cry - buckets full!!! I feel so blessed to have been able to know and work with these people. All are wonderful, Christian, thoughtful, and caring folks, who give above and beyond on a daily basis to the kids that we all work with. There is a special place in heaven for these people! Take care my friends - off to work I go! Remember the song - Slow down, you move too fast, You've got to make the morning last? Well, that's how my life suddenly seems! I've heard older folks say that the older you get, the faster time goes, and I am beginning to believe them! The card I chose to make this evening is for two challenges. 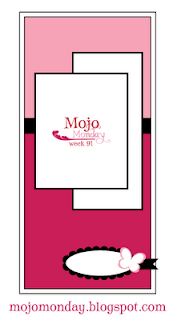 Mojo Monday Week 92 had the sketch shown above. You can see how I attempted to follow their awesome sketch! Melisa over at Paperlicious Designs, also had a sketch. For her sketch, I was to use Angel Co. stamps, and stamp repeatedly to create your card. Supplies: TAC Beautiful Day, TAC Tag Tidbits, Palette Noir Ink, Black and White CS, TAC Gentle Beginnings DP, Fiskar's Scalloped Scissors, Ribbon (Hannah Stamps), Black and white brad (unknown). Hope you like it, and that you are having a good week. We are well on our way to another weekend, and it is supposed to be about 100 degrees, and of course, the heat index will add to that! Maybe a good weekend for an indoors project??? ~Don't count the days...make the days count! First, I want to wish each of my Angel friends a wonderful trip to Wichita this week. I think that most are leaving tomorrow. Hopefully, the weather will be nice, and all will have a great time at Seminar! Be careful ladies! My card today is my first ever House Mouse card. I've never used their stamps before! They are adorable! This little guy is called Chalky Fingers, and as you can see, he's at the chalkboard. What a cutie patootie! The sentiment is from Great Impressions. I made this card for a challenge over at the House Mouse Challenge site. My H.M. coloring needs some definite work, but I will probably play again! Hope you have all had a great day - summer school is over on Thursday here, and I'm looking forward to that (I'm pretty sure the kids are too!). ~If we must disagree, let us not be disagreeable! Good Morning! I hope that you are all enjoying a beautiful Sunday morning. It's been very quiet here. DD is off to try a new contemporary church in this area, but being Father's Day, I'm trying to dote on/spoil DH a little bit, so I stayed in with him. He's not feeling real perky. I'll be relieved when all of these tests of his are done! Today's card is for the Etsy Challenge over at Heart Hugs Designs. Again, there is a wonderful Etsy store, The Potato Patch, and the challenge was to pick out something to inspire a card. I loved all of the cute things (after all, I totally AM a granny-wannabe), but here is the one that I picked. 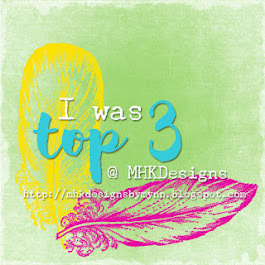 The leaf stamp is from PSX, and the sentiment is a Kolette Hall from the $1 bin at Michael's. The ink is Memories, Cherry Red, and CS is DCWV. Talk about a clean and simple card! I don't think any details are needed for this one! By the way, Chat Dump Girl, this is a virtual invitation for you!!! July ??? Let me know after the 1st when you will be in town - my treat - Pad Thai??? Pasta House??? 12 West??? Your choice! I just realized that I have a swap that is due (must be delivered by July 1st to Florida! ), so my job for today is to brainstorm. The theme is "summer", so it should be an easy one! Take care my friends - have a relaxing and safe Father's Day, and God Bless all of those dear dads out there. If you still have a dad, spoil him rotten! 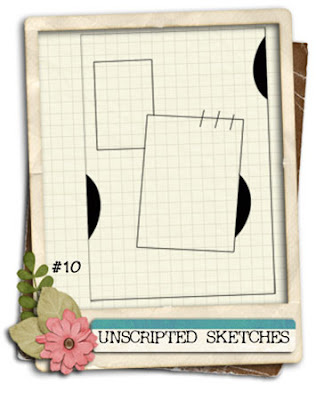 This week's challenge, over at Unscripted Sketches was a fun sketch. As soon as I looked at it, I knew that I had to grab one of my all time favorite Stampendous Stamps! The lady on this stamp is just having the best time, and her cheerfulness is contagious. Whenever I want to stamp "happy", she's what I reach for! Caryl, I think we really need to name this lady too! For the staples, I opened up one of the ends, strung them with little pink beads, and then punched holes where the staples needed to go. I pushed them through, and closed them on the back side - fancy ladies need fancy staples! I'm off to the city for a doc appt. with DH. It will probably be a LONG day, so have a good one, and I'll be back soon! I saw that there was a challenge over at Three Clovers. The challenge was to do a ONE LAYER card! 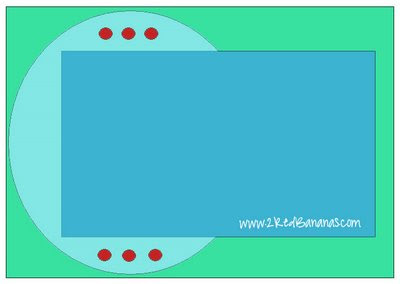 You could add an embellishment, but the card needed to be one layer. Wow - that's a big challenge for folks like me that just keep adding another layer, another flower, more bling...you get it, right? Well, I thought - what better opportunity to show the new duster technique that I learned from Darlene Domel last weekend at the Rubber Stamp Getaway! So, without further ado, here is my card. I will be nice, and just list the supplies below! I've named this card "Dream Girl", as my only embellishment is a little metal piece that says "dream", and this gal looks to me, like she's dreaming of a handsome man coming to rescue her on his beautiful white stallion! If I had to name her, it would be something exotic, like Jasmine, or Genevieve.... I hope you like it! Let me know what you think! ~Baseball players are smarter than football players. How often do you see a baseball team penalized for too many men on the field? I have been so remiss in not posting awards that have been passed down to me. I thought that tonight would be a good time to do that! This first award is from Lynne, and was given to me a long, LONG time ago! Lynne is one of my most faithful readers and commenters, and I appreciate her taking time to come and visit day after day! Lynne has a delightful blog, that you really should go visit sometime! The next two awards were given to me by another faithful reader, Lisa. Lisa lives in sunny California, and never misses a chance to drop me a comment on my blog, or even a personal email to let me know that she’s thinking of me. I felt an instant connection to Lisa, and I think if we were closer, we would be crafting buddies! Lisa, also has an amazing blog - be sure to visit her too! The first is an award (above) came to Lisa from her friends, Debbie Pamment and Kristine Breach. According to Debbie's post, it was created by Kellie Winnell and passed along to her with the following quote: "I feel that there are a lot [of blog awards] out there that are awarded for the creative sides of things, and I love them, but few [blog awards] to just appreciate the people that follow and comment on your blog, which to me nothing makes my day more than having gorgeous comments left on something you created, really lifts the spirits and makes my day." 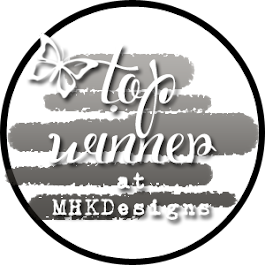 Kristine paraphrased that by saying this award means, "Thank you for your support... for leaving sweet comments that really lift my spirits and make a bad day better... for comments that go beyond the typical "Great card!" and really connect with you on a personal level. "Like Lisa, this award has been a pleasure. Making friends with folks from all over the world has just been an incredible experience! It’s wonderful to wake up in the morning to comments from Malaysia, or Sweden, or Canada, or Indiana! These comments truly lift me up and make me feel like I should continue on!!! Days when my mojo seems to have got up and went, I get a pat on the back that picks me up and sends me back to my desk! Thanks Lisa, for thinking about me with this award! Your friendship is a blessing to me! 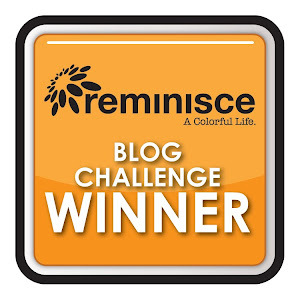 This blog award (above) is the Spreader of Love Award, and is for people who have made a difference to you by their visits to your blog, the things they write, the interest they take. Again, this made my day!!! 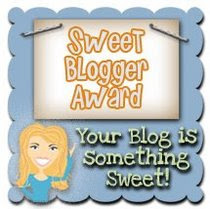 The award above comes to me from my blogging friend, Pat. I'm not sure where Pat lives - I've tried to find it on her blog, but can't find a link. I'm pretty sure it's a LONG ways from here! Pat is another good friend that rarely misses leaving a nice comment when I post a new entry. The catch to these awards, and the main reason I have been so remiss in posting them, is that I am supposed to pass them on to my favorite commenters and/or blog readers. Dear friends, how could I ever choose between you? So, Lisa, Lynne, Pat, Barb, Shirley, Theresa, Brenda, Tami, Caryl, Curt, Crystal, Brenda, Melisa, Seleise, Chelemom, Bridgett, Steph, Nilla, Fran, Lisa F, Maria, Anne, Caroline, etc., etc., etc., all 45 followers and faithful commenters, please feel free to 'grab' any or all of these awards with my love and blessings! Post them on your blog, and pay them forward. That is what life is all about! Thanks everyone for helping me through these past months. Hugs! Hard to believe that tomorrow is Wednesday already! Hope you have all had a good week so far. Mine has been busy, but not too bad. I finally had time to work up another challenge. 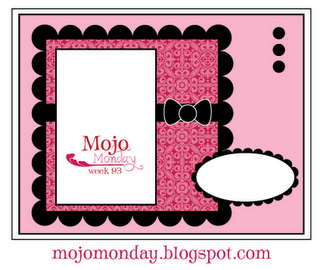 This very silly card is for the Mojo Monday challenge. The sketch was fun, as it was sized for a business envelope - something different! I looked for a tall and skinny stamp, and found this one that I'd forgotten about. There is no 'name' on it - only the copyright sign and the letters PSX. The sentiment is from River City Rubber Works. You can't really read the sentiment - it says "Thank goodness wrinkles don't hurt". All papers are Three Bugs in a Rug. Base card stock is DCWV. I used the EK Success Bubble Edge Punch, my Fiskar's deckle edge scissors, and although you can't tell from the photo, this babe is all glitzed up with the Starburst Glitter Pen by Sakura. Hope she makes you smile! (I think she is so ugly, she's cute!) Maybe Caryl will come up with a snazzy name for her! ~A faultless person is possible only in a faultless world. DD and DH have slipped off to play some tennis, so I thought I would slip off to the computer to report in on our weekend! Yesterday was our baby shower. It was pretty successful! There were around 20 present, and all seemed to enjoy themselves! If possible, I'll post a few photo's later - they are all on DD's camera. Today, my friend Shirley and I went to the Gateway Rubber Stamp Getaway in Illinois. We had a wonderful time. There were so many wonderful exhibits, and we learned some amazing new techniques and tricks. I do have some photos to show you from our day today! We visited "Stampland Chicago", where the most amazing folks were. We met Darlene, and her very helpful and knowledgeable husband. They have Stampland Fine Art Rubber Stamps, and Stampart Museum and Gallery in Chicago, Il. In their factory, they make all of their own stamps, and in their museum, they have stamps dating back into the 1800's. They are open by appointment only, but it you are in Chicago, it would be well worth a call and a visit! Their number is 773-478-7696. The first photo is one that was done with Darlene. She uses ink and dusting brushes! They sell the most phenomenal masking tape, and a wider tape to use for actual masking of stamped images. She'd been using the same strips of tape for about 150 cards at the point where we sat down to play! I love the collage look, and bought a bag FULL of new items from her booth to play with! The brown card with the deer is one that I made at The Paper Cut's booth. This is another of my favorites each year. They have many precut albums, cards, etc., and the gentleman that runs the booth each year is fantastic about picture taking so that you remember what to do with your kits when you get them home! The card pictured is one of their precut cards, and the deer is actually a real photo printed off of the computer in black and white, onto a piece of acetate, and then inserted in the open rectangle. I did not stamp a sentiment, as I wasn't sure what I wanted it to say, but isn't it a wonderful masculine card? It's definitely worth a stop at their website to look around! I spent much of my allowance there as well! The last photo's were just so much fun, I couldn't NOT take them! 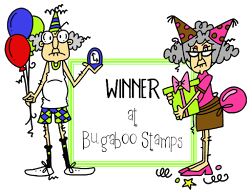 Jan McGowen is a Stampin' Up demonstrator, and has a booth each year. She is also very willing to 'share' her knowledge and techniques, whether or not you purchase a thing. She was probably one of the most pleasant and cheerful vendors on site today. Jan was very open to my photo taking, and I took her up on her offer! She had some of the cutest little match boxes, treat containers, cards, etc. Even her business cards were just too much fun! There was a York Peppermint Patty in between the two scalloped circles! I'd seen this done before, but never for a business card! Great idea Jan! All in all, it was a great day. We pretty much closed up the place at 3:00, stopped by Arby's for a flavored tea, and headed home. The trip home was uneventful, and the evening has been relaxing and quiet. Hope you have all had a nice weekend too! Tomorrow is the start of a new week, and I think my countdown is at 14 or so. DD is a goddess on her pedestal tonight! She brought me in some camera batteries, and I can finally post what I've been doing this week instead of challenges! The first pictures are of some thank you notes that I made for the new mommy and daddy. There were SO many scraps of paper, that it seemed sinful not to use them for something. So... I took some Ivory Wasau CS, and some Ivory envelopes and made some cards with the scraps. (Lisa, are you reading this??? Windy City Stamper??? I USED SCRAPS!!! The sound you are hearing is me patting myself on the back! I then took some blue and brown CS and made a box for them. The lid is scalloped with a Martha Stewart edge punch. I could absolutely NOT get the lid exactly right, thus the strip across the top to hold the ribbon in place to hold the stinkin' box lid on!!! Lol... Whatever works! The gorgeous basket was made for me by a friend from work, Paige Reid, for my retirement. The nugget favors fit into it beautifully. A piece of 2" dotted ribbon tied it all together. Again, the photo's just seem dim to me. The colors are so pretty IRL, and I'm a little disappointed with the pics. I'm working on an outside spot, so hopefully if it ever stops raining, and the tornados run their course, that will work better! DD is in charge of the food for the shower, so except for a couple of easy peasy games, I think I'm done! Hope I have not bored you all to tears! Thanks so much for looking! On a personal note... My countdown is at 14 work days now. It's very bittersweet. I'm itching to get started cleaning and painting and fixing things here at home, but at the same time, it's breaking my heart to think of leaving the kids that I work with. To some of them, I'm like the 'mom' they have never known. Anyway, the days are flying by, the tears are falling, I'm giddy with excitement, and frozen with fear over what the next phase of my life will bring. Arghhhhh....enough of that dismal, depressing, boo-hooey stuff! Life is good! Have a wonderful night, dear friends! If any of our Wisconsin family is reading, we had such a nice visit this weekend! Loved seeing each of you - BIG hugs!!! Just ordered my first ever Hannah Stamps! Can't wait to play - love those cute little Riley's, so I ordered two of them! Off to look at shower recipes, think about games, etc. Will post later - DD is to be bringing me in some batteries for my camera later this evening! 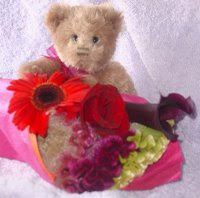 ~Good examples have twice the value of good advice. It's so nice to have friends like Maria that worry about me when I'm out of touch! Just wanted to let you all know that we are fine. No storm damage - this one seemed to just go all around us! Hmm...what else? OH... I was ready to take photo's of the newest additions to the baby shower, and realized my camera batteries are dead! Tomorrow after work......I promise! That's all for tonight - sleep well! ~If you blame others for your failures, do you also credit them for your successes? Instead of a card tonight, I decided to post a few photo's of the storm that is currently blowing through (literally) our little area in Missouri (again!)... Tornado warnings, thunderstorm warnings, etc. - you know the routine! Anyway, the sky is just so awesome, that I had to shoot some pics. The brightness is actually lightning all over the night sky, lighting it up! Nights like this are good for the soul! A majestic sky, a storm smell in the air... God's beauty is at work once again! Oh...I guess I need to give you all a chuckle for the evening! Sunday morning I went into my newly remodeled bathroom fit for a queen, blew my nose, leaned over and dropped the tissue into the toilet, and splash - my glasses fell right off of my face and into the stool. Well dear friends, this in itself would not have been a major disaster, except that I had just reached out and pushed the flush button!!!!! Yup, for sure. I flushed my eyeglasses right down the toity! Yikes! Of course, we tried everything to fish them out, to no avail. So today, up came the nice new toilet, and out came the glasses! Whew....they had lodged in the first U and hadn't gone down all the way to plug things up to the point that the concrete floor in the basement had to be dug out! I'm sure that there is a moral to this story, but I can't think of one just yet! LOL, bet no one topped that one today!!! Have a great night! Eyeglasses are in the dishwasher, and I'm at my craft table working on Thank You cards for the new mommy to be! ~We are not put on this earth to see through one another, but to see one another through. It is Country Days weekend in Farmington! There is much to do, and Saturday begins with a 1 mile run, a 1 mile walk, or a 5 mile run. Well, I am certainly not physically able or mentally inclined to attempt anything that says 5 miles, and does NOT include wheels and an engine... So, at the sweet young age of 55+, and probably at LEAST that many extra pounds, I decided to get up at 6-ish this a.m. and go into town with DD for an attempt at something a bit smaller. I have never, EVER done a walk or a run before, so this was a first. I got very brave and decided that after DD ran the 1 mile, that I could certainly WALK the one mile. (especially, as DD was going to come back from running her mile and walk WITH me!!!)lol... So... I get in line, am trying to be so very brave, and Senator Kevin Engler, who is in charge of the event, says, "okay, we are about to begin - are you ready?" Of course we are. (ugh). THEN he says, "runners in front, walkers in back, it's one mile down and one mile back". Yep, I panicked BIG TIME! I'm nearly hyperventilating at the thought of walking TWO bleeping miles when I have not even had my coffee yet!!! Of course, DD says we can do it, and off we go. The long and short of this story is that Patti J. walked her very first official MILE race! We went oh so far, and decided that we would only walk half of the two miles. Anyway, long story, and I really didn't earn the shirt, but it's paid for, and I did walk the mile that I intended, so I am spending the rest of the day patting myself on the back for a job well done. Next year, I will walk between the cones and cross the finish line! We have family in from Wisconsin, so tonight, we will all go to the free concert in the park, featuring Aaron Tippin. Should be fun! NEWS FLASH!!! 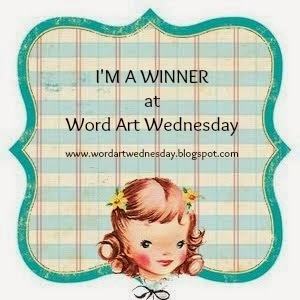 I entered the Etsy Inspired Challenge over at Heart Hugs Designs on May 31st, and I found out yesterday that I won! I know it was just a random generated pick, but it still feels like winning a lottery! Ha! 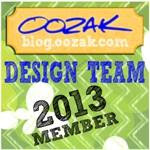 I got so flustered when I saw my name on their site, that I didn't look to see what I won! It will be a surprise! I've been working on baby shower favors for a shower DD and I are hosting next weekend for some friends of hers. I posted the invitations a few days ago, and now I'll show you the favors that have been popping up all over the place this week! There are lots of photo's showing the progression of the boxes, so don't feel obligated to look at them all! DP is all by The Paper Studio. CS is all DCWV. Ribbon is from Hobby Lobby. Have a great Saturday, and maybe I'll get back to post again tomorrow! 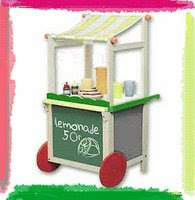 ~We make a living by what we get - we make a life by what we give.